I’m not sure how to describe what we did together to others and so far, I haven’t had to! 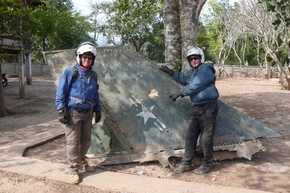 My head is reeling with the number of unique sites and experiences we shared on the Ho Chi Minh Trail ride and I look forward to the photos and videos to relive some of them. I trust that your return trip from Lao is easier than mine, and wish you all the best. I hope that we get to ride together again. I invite you to come to Canada; I’m already planning a trip for you here. Once again, my thanks to you all for a most excellent adventure in Lao.